(Newser) – President Obama arrived in Jamaica last night, and his first stop was the Bob Marley museum, the BBC reports. 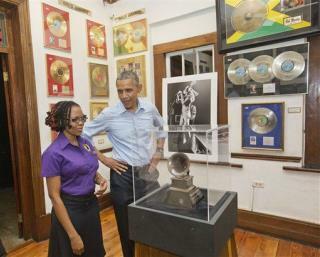 Obama is the first US president to visit Jamaica since Ronald Reagan did so in 1982, and he's apparently a big Marley fan: During his 20 minutes spent touring the Victorian-style house where the musician lived from 1975 to his death in 1981, he told the guide, "I still have all the albums." The stop was an unscheduled one, the AP reports. During the months I spent in Costa Rica, it was Marley 24/7. Bet his secret service staff gets into trouble here to? "Quiet, empty streets." Anything to undermine this president. I'm surprised they didn't claim that Reagan was greeted as a hero in 1982.